Five times speaker of colonial assembly, moderator of provincial congresses, 1774-1775, leader of Revolutionary movement. Lived 11 mi. 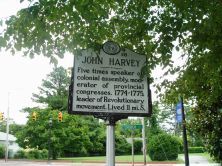 S.
John Harvey, political leader and Revolutionary Patriot, was born at Harvey’s Neck in Perquimans County in 1724, the son of Thomas and Elizabeth Harvey. Harvey was born in into a prosperous and politically involved family. His father was a colonial justice and member of the Governor’s Council and his grandfather had been the deputy-governor of the colony from 1694-1699. Harvey himself received two slaves prior to his fifth birthday. Little is known of Harvey’s early years, or whether he attended school locally or abroad. Nevertheless, by age 21, he was already representing Perquimans County in the Colonial Assembly. He continued to serve as an assemblyman and a county justice throughout the 1750s and 1760s, and was instrumental in the movement to establish a post road through the eastern part of North Carolina. In November 1766 he was appointed the speaker of the Colonial Assembly in the first session held under the governorship of William Tryon. By 1768 Harvey was an outspoken critic of the British Parliament’s taxation policies, namely the Townsend Acts. Although he would later support Tryon’s efforts to destroy the Regulation, Harvey instigated the passage of several non-importation associations and other legislation opposing overall British policy. In 1773, Harvey was named head of North Carolina’s first Committee of Correspondence, the body appointed to communicate with other colonies concerning Crown policies deemed detrimental to America. 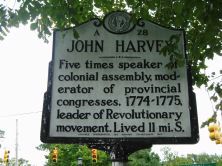 In 1774, Harvey was appointed moderator of the First Provincial Congress in New Bern, in direct violation of the orders of Royal Governor Josiah Martin forbidding the body from meeting. The following April, as Martin called the Assembly to order, Harvey convened the Second Provincial Congress at the same place on the day before. As it had done the previous year, the Congress appointed North Carolina’s delegates to the Continental Congress. Martin, infuriated, disbanded the Assembly and eventually fled the colony. Only a month after the meeting of the Second Provincial Congress, Harvey died of illness contracted following a fall from his horse in Perquimans County. Had he lived, Harvey undoubtedly would have played a much larger role in North Carolina’s Whig politics during the war. Nevertheless, his role in instigating the break with Great Britain earned him the title “Father of the American Revolution in North Carolina” by historian R. D. W. Connor. Harvey left a wife and seven children. Two of them, Thomas and Miles Harvey, both served in the 1776 General Assembly that adopted the Halifax Resolves.